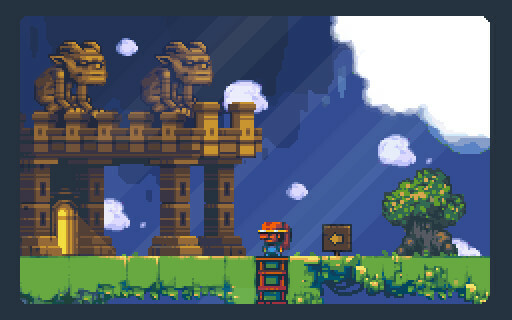 Pocket Kingdom is a rich and wonderful puzzle game that is an amazing example of progression in game design. What attracted me to this title were two things; one believe it or not, was the Steam suggestion tab. In a rare lightning in a bottle moment the suggestion system actually worked. Secondly was the wonderful art from the screenshots. I knew I had to get my hands on this game and I am glad to say that I didn’t regret it. The setting for Pocket Kingdom is of the steampunk variety with a big dollop of magic. You are a down on his luck adventurer who takes on a job to find a mystical floating island and take a picture of the slumbering god that inhabits it. Needless to say, easier said than done. You get shot down by pirates, thus begins the adventure. While the themes are very familiar in Pocket Kingdom the entire lore is original and at times a bit odd. The reason for that is that Pocket Kingdom does not hold your hand much in this game. From a lore standpoint the game acts like its lore is all common knowledge, there are names thrown around and you feel like you are always trying to catch up to what is going on. It’s not a gripe necessarily, but I do feel that to fully grasp every single detail of the story, that it might benefit from playing the game twice. Now there are signs to tell you what buttons do what and occasionally a use this tool here type of thing, but you do feel very much bewildered when the game starts. I didn’t mind this to be honest and I felt like I was on an adventure in a strange world. Upon heading up the cliffs after your “landing” you soon discover that you are not the first and surely won’t be the last to land on this island. There are several districts all brimming with their own people, factions, and lore to digest. The inhabitants tell you the basic rules of what they have learned to call, “Pocket Kingdom.” Doors and ladders are the only means of traversing from area to area, as physics is warped and walking left might just leave you all the way on the right. Additionally, the god of the island is a trickster and puzzles are springing up all over the island. Lastly, escape is nigh on impossible and you’re out of luck! Those rules are very important as you begin taking on the various puzzles the island has to offer. The game is played from a classic side-view and the basic goal is to explore, find useful gear, and get off the bloody island. Also, if at all possible, snag a picture of this supposed God. How you go about this is completely on you, this is a game you will beat at your own pace. I absolutely loved the progression in Pocket Kingdom, the puzzles get harder and harder but never did I once feel overwhelmed. The puzzles involve boxes, levers, and lasers. Things get tricky though when you begin throwing in grappling hooks, rocket launchers, and gravity pads begin to appear. Remember I said physics is warped? Yeah you can fall and land on top of the screen. It definitely takes some time to wrap your head around and makes puzzles dynamic as hell. I applaud the puzzle design as I couldn’t imagine how the developer came up with such clever ways of using a simple concept. When it comes to difficulty, there is going to be plenty of trial and error, no puzzle will stop you but some will take longer for you to figure out. Experimentation is key here but it never got tiresome for me. Also there is plenty of that “AHA” feeling when you get things working the way you want. It’s very satisfying. There is an over-world map that you can traverse that is riddled with secrets, passages, treasure, and easter-eggs. Progression is handled beautifully here as well, as you gain access to different parts of the island bit by bit. Going about finding all the rooms on the island is quite a task. Attention to detail is important and exploration is usually rewarded. As a reviewer, my tip to you would be generally if you are looking to get somewhere that chances are there is a passage nearby. Along the way you will collect gear that will help you navigate the island and make getting around less of a grind. The aesthetics are strange but in good ways. The area that I felt was the weakest was the Sprite design, as you run into many characters that all look the same. However, the areas themselves are magically archaic, feeling old but brimming with an unseen life. Certain areas have a great amount of detail to them and look wonderfully rustic. Each area has generally its own theme and all of them are well done. My favorite is easily the Abandoned Temple, with the Pirates coming in a close second. Overall I was very impressed with the game itself, it’s designed very well. There are some gripes here though, the UI is particularly wonky, at one point getting locked on the reset progress screen, much to my terror. Using the Steam overlay caused a few graphical errors where my character was in a place he actually wasn’t. Nothing restarting the game didn’t fix but enough to note. The music/sound in the game was on par, but did get a bit grating on the ears sometimes. The music tends to repeat itself. Not a huge complaint and honestly this will vary depending on personal taste. The game does feature Steam Cards/Achievements, and happily does have full controller support. From a replay aspect, that is up to how much you care to fully understand the world of Pocket Kingdom. You could just get all the secrets and discover all the rooms and call it a day. That took me about six hours in total. I imagine a second play through would take significantly less. Pocket Kingdom is a satisfying game in all regards. I am honestly very happy I discovered this game and greatly recommend it. You have seen games like this before so while not on high on the charts for innovation, if you loved games like Escape Goat or Blackhole then you should check out this game. It’s fun, relaxing, and I loved the great puzzle design. At the ridiculously low price of $6.99/£4.99 this is guaranteed to pay for itself in enjoyment. Oh, and a nod for the people who have played it; Room 74 is impossible to find. Gamer, Writer, Dungeon Master, Geek, Lover of film and art.